HEAVEN & EARTH–the Los Angeles-based quintet who masterfully fuseelements of hard rock, blues and bits of classical on their acclaimed album Dig, which they toured Europe in support of throughout 2014–are back in the studio working on a new album(produced by Dave Jenkins and available via Quarto Valley Records) set to be released this fall (title and date TBA). 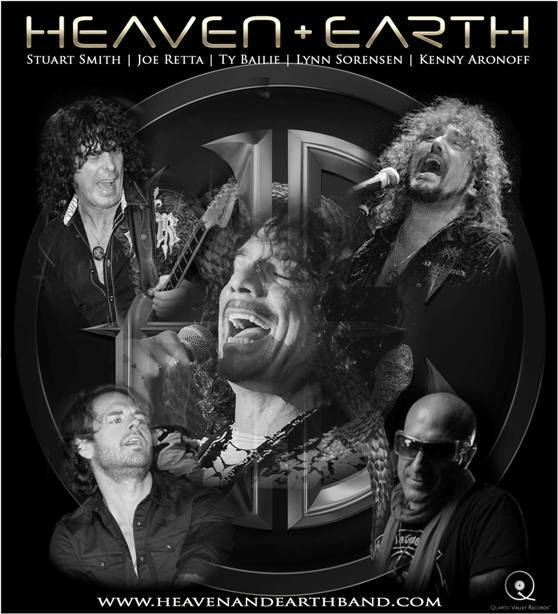 In between writing and recording the new album,HEAVEN & EARTH—Stuart Smith (band founder/guitarist), Joe Retta (vocals),Kenny Aronoff (drums), Lynn Sorensen of Paul Rogers/Bad Company (bass/vocals) and Ty Bailie (keyboards)–will make an appearance at the Väsby Rock Festival in Stockholm, Sweden on Saturday, July 17. Simon Wright (AC/DC, Dio) will be filling in on drums for Aronoff, the band’s regular drummer, as he’s currently on tour with John Fogerty. HEAVEN & EARTH connected strongly with music audiences on their 2014 17-date European tour, garnering strong reviews along the way. 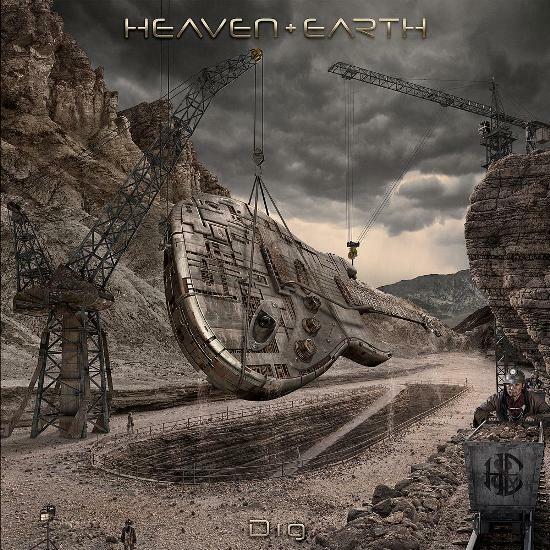 HEAVEN & EARTH‘s third studio album, Dig–released April, 2013 on Quarto Valley Records–was produced by Dave Jenkins–who’s turned the knobs for everyone from Metallica to Tower of Power. The album features special guests Howard Leese(Heart, Paul Rodgers), Richie Sambora (Bon Jovi) and David Paich (Toto). HEAVEN & EARTH’s music comes together explosively on the album’s first single “No Money, No Love” and its controversial video which has logged over 545,000 views and can be viewed here: http://tinyurl.com/cdopr5d. Stream Dig on SoundCloud or Spotify now. The origins of HEAVEN & EARTH align the band’s founder and visionary, Stuart Smith, with a rich lineage of rock’s most celebrated musicians. Kelly Hansen(Foreigner), Joe Lynn Turner (Rainbow) and Kelly Keeling (King Kobra) all fronted the band at various junctures. Guitarists Richie Sambora (Bon Jovi) and Howard Leese (Heart, Paul Rodgers), singer and bassist Glenn Hughes (Deep Purple, Black Country Communion), bassist Steve Priest (Sweet) and drummer Carmine Appice(Jeff Beck Group/Vanilla Fudge/Rod Stewart), among others, have each contributed their extraordinary talents to HEAVEN & EARTH’s first two albums: Heaven & Earth Featuring Stuart Smith (1994) and Windows to the World (2000).HEAVEN & EARTH‘s groundbreaking debut album, Heaven & Earth Featuring Stuart Smith, is considered a cult classic and brought Smith to the forefront of the guitar elite being compared in the press to Deep Purple’s Ritchie Blackmore,Jeff Beck, Eric Clapton and Jimmy Page and garneringSmith the award for “Best Guitarist”and “Best NewCD” for three years running at the Los Angeles All Access Music Awards. In the summer of 2012, the guitarist set out to mold HEAVEN & EARTH into a world-class recording and touring band which led to the recording of their new album Dig and now the future has never looked brighter for the band.